This novel tells the story of a father and daughter team of sand-sculptors, who embark on a crazy adventure from Bondi Beach to a magic mountain in New Zealand, exploring the transient nature of art and life, to discover that dreams are real. Sarah sat at the side of the road, with what looked like the contents of her pockets spread out on a towel before her. "What are you doing?" her father asked. "I'm fishing for trout," the girl told him. The father looked amused, but said nothing, and determined to watch how the game proceeded. Soon a passer-by stopped, and asked Sarah the same question. "I'm writing a book." she responded. Each person who stopped to ask, and the father counted fifteen in about ten minutes, was given a different answer. "How many trout have you caught?" he finally asked. "About fifteen in the last ten minutes," the girl answered. The book has also been released for Amazon's Kindle Reader. This means it is available to be read on all mobile devices including the Blackberry, iPhone and Android phones, as well as for the iPad, Mac and PCs. Buy the Kindle edition for US$5.49 from Amazon. Order this novel in paperback from bookshops or online stores like www.amazon.com. You can also check out Australian Reviews or American Reviews of the novel. Born in 1954, Alan Clay grew up in Auckland, New Zealand. He studied clown in Sweden in 1977 and has taught and performed extensively in Europe, Australia and New Zealand. 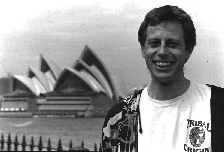 For the past ten years Alan has lived in Sydney, where he runs Playspace Studio, Sydney’s Physical Theatre Studio. 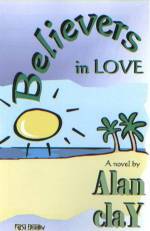 ‘Believers in Love’ is Alan's third novel. His second Dance Sisters was published in 1997 and his first Moontan was published in 1994.